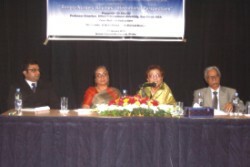 (L-R) Dr Shamsad Murtaza, Professor Firdous Azim, Dr Afia Dil and Dr Wakil Ahmed. For centuries, nursery rhymes have been universally identified as poems for children, used in children's games or even to lure them to sleep. Along with the rhythm, nursery rhymes also manage to build certain images and colours which make an impression on the children's mind. For instance, the famous English children's rhyme, Humpty Dumpty, sitting on a wall and then falling from the wall and breaking into pieces, is said to be an egg and gives out the image of an egg with human features to the children or to anyone who reads the poem. However, nowhere in the poem is it mentioned that Humpty Dumpty is actually an egg. Surely, there is a little history behind the creation of this rhyme, which probably was never written for children. Whatever maybe the reason behind the creation of this poem, Humpty Dumpty today portrays the image of a funny and clumsy egg to the children and at the same time appealing to the children with its unique rhythm. “Did you know that we normally do not say 'thank you' to others?” asks Dr Afia Dil, Professor Emeritus, Alliant International University, San Diego, USA. “It is just not in our culture to say thank you. But that does not mean that we are a thankless nation. We thank others through our activities and other kinds of exclamations, for instance, 'you should not have done this for me,' 'look mother, what she has brought' or 'that was absolutely unnecessary'. Substituting all this with a simple 'dhonnobad' or a 'thank you' would mean that we will remember the favour or the kind gesture shown to us by someone only for a little while.” Dr Dil was sharing her discoveries in the Bangla language and their contextual meanings with the audience while presenting her paper 'Bengali Nursery Rhymes: International Perspectives' at the British Council. Present at the discussion panel along with Dr Dil were, Dr Wakil Ahmed, Supernumerary Professor of the Department of Bangla, University of Dhaka, Professor Shamsad Murtaza of the Department of English, Jahangirnagar University and the Chair of the session, Professor Firdous Azim, Chairperson, Department of English and Humanities, Brac University. Dr Dil was referring to a famous line Chul chete bole Shingho / Taka nai Napit moshai / Dekha hobe bhobisshote / Many thanks, goodbye. “Normally, we don't find Bangalis saying 'many thanks, goodbye,'” says Dr Dil. “In fact, there is no direct translation of the work 'goodbye' in Bangla either. If we look at it in context, we say ashi in place of 'goodbye', which literally means 'see you again. '” Dr Dil further points out at the several cultural, political and social connotations that are found in the children's rhymes, for instance, the age old spar between the genders, old wives' tales, folk traditions and the tiffs between land owners. A good example of political and economic features that have been recorded in a very old nursery rhyme is the lullaby, Khoka ghumalo para juralo / borgi elo deshe /bulbulite dhan kheyeche / khajna debo kishe / Dhan phuralo pan phuralo / Khajnar upay ki / Aar kota din shobur koro / Roshun bunechi. According to Professor Nilufar from the Department of English, Chittagong University, this is in reference to the Borgis, a dangerous group of people who used to loot and plunder the people of Bengal. People being picked up and punished from villages for not being able to pay the taxes, was a normal scene in those days, something that even children grew up watching. This rhyme probably came about when a mother was trying to put her child to sleep, spinning a spontaneous string of words and sentences from her surroundings. The discussion, which was organised by BELTA, had several professors from different parts of the country attending the event. Dr Dil's effort to draw a line between the Bangla nursery rhymes with an international perspective was well appreciated, especially where she tried to bring forth the cultural, linguistic and social elements in children's poetry. However, the additional comments, reports and discussions by the others in the room created an interest amongst many to study this subject further and discover the history hidden in the rhymes.